Park Shin Hye International Fanclub | 박신혜 국제 팬클럽: [ENG] Park Shin Hye and Jung Yong Hwa in "韓國TVドラマVol.50"
[ENG] Park Shin Hye and Jung Yong Hwa in "韓國TVドラマVol.50"
Jung Yonghwa and Park Shinhye first acted together in You’re Beautiful (2009 SBS) and then in Heartstrings (2011 MBC). Having gone through difficult and happy times together, they have become friends at work and supportive to each other, to friends who can simply understand each other just from each others’ facial expression. On 16th July 2012, both of them held a Heartstrings fanmeeting in Japan. We will show you their natural sides through this interview! Q. We have been waiting so long for the both of you to promote together in Japan! How did you feel when you first heard of the fanmeeting? YongHwa: We have been thinking about when we could hold the fanmeeting for a long time. ShinHye: Yesyes, I have been waiting for the chance for us to promote together, it has finally come true! The fanmeeting was an enjoyable experience! Q How did you feel about becoming Leeshin and Gyuwon after about a year later? SH: I did not feel any stress, but Shin seems to not be able to find his feel since the rehearsal just then. YH: (Looking at SH’s photo on page 46) Wa, you look so pretty then! SH: Thank you, (Looking at YH’s attached poster) Wa~ So handsome, who is this? Do you know him? YH: Hohoho, Shin is really handsome! SH: Can you introduce him to me? Q: So.. Where is Shin now? Q: How did you feel about performing the gayageum? SH: Even though it doesn’t happen now, I used to get splinters during practising. I was very happy to play the gayageum after so long. It has brought up many memories! YH: We can probably play a band and traditional music band duet if you practised long enough, the atmosphere would be even more high. YH: It was a regret the Stupid members could not come together and perform for everyone! Q. 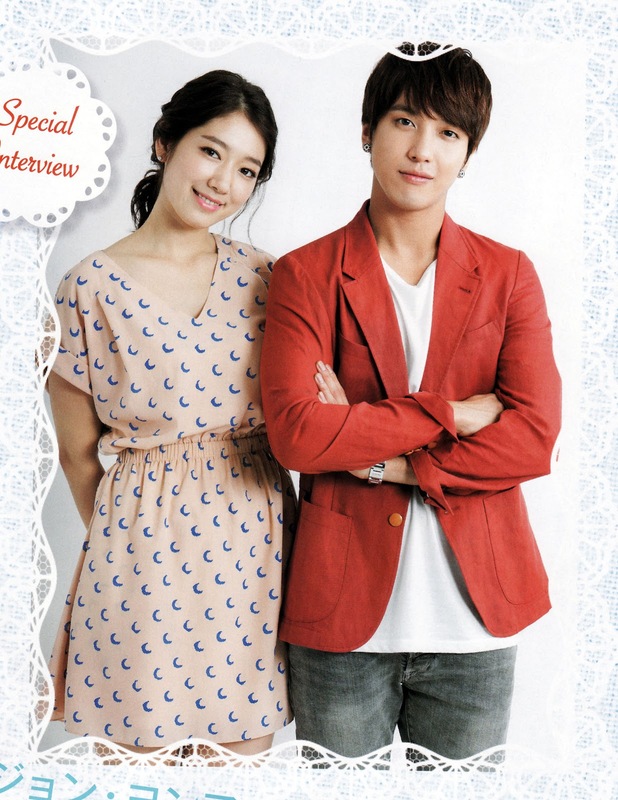 Having seen "Heartstrings" content again, what memories did it bring back? SH: Everything during filming! It’s amazing how everything including the NG scenes are still so clear in the mind. YH: Yes yes! Why we would laugh, oh there is such a scene and why we will act in that manner then etc. SH: (nods head) It was always hot and raining, we have suffered a lot! 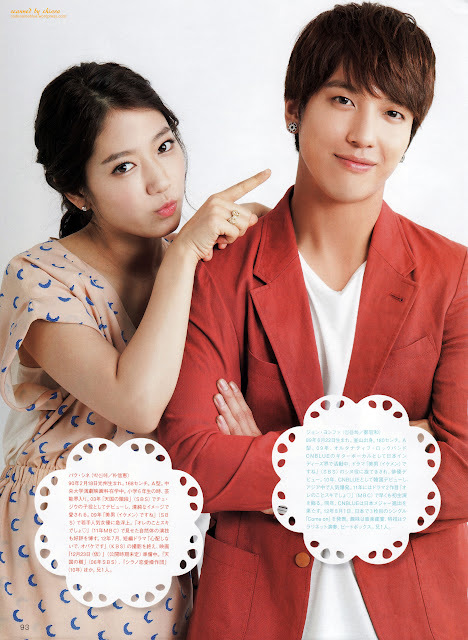 YH: Thinking of "Heartstrings" bring back alot of memories, I have devoted much of my feelings in this drama. There were many same-age actors so it was always fun and enjoyable in the cast! Q. 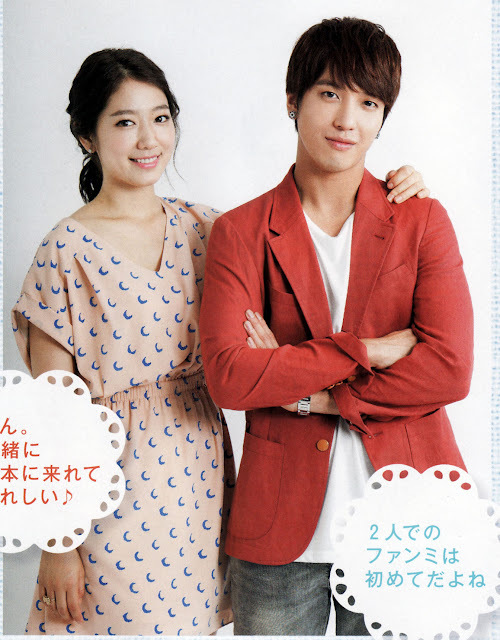 "Heartstrings" have been showing in Japan, have you watched it with Japanese voiceover? YH: No, I have heard about it but I have not watched it. YH: What time does it air today? 2.43am? That should be in the midnight? I think we should just see the live version instead! Q. Has there been any moment where you have fallen for Yonghwa during filming? SH: When he was singing "Because I miss you". The amount of feelings he put in the song was just right, he was very handsome! Q. Honestly speaking, how do you find him as a man? SH: Very good of course! Very good! Although he is not very straight forward at times, he takes good care of others and is mature, he also encourages me! YH: (whispers) Shin don’t really like to talk. Q. Is the real Yonghwa more attractive? SH: That is definitely! Shin’s charm and Yonghwa’s are completely opposites, they are not on par! Q. What about comparing Singer Yonghwa and Actor Yonghwa? SH: I think the music stage allows Yonghwa to completely reveal his leadership skills and power but he can channel the reserved and quiet inner self during acting to give his character more charm. This can all be felt through the camera lens. After seeing him putting in more and more effort and growing up to where he is today, this is what I feel about him as a person who has been guarding beside him. Is Shinhye’s ideal type closer to Yonghwa or Hongki? Q. What are Gyu Won and Shin Hye’s charms individually? YH: Individually? Both of them have many similar aspects. They are always cheerful and hardworking.. their good points are very similar! Q. Do you feel any difference in them? YH: When we were shooting You’re Beautiful, SH is more like Minam. With all the male actors (Jang) Geun Suk Hyung, Hongki and me, she seems to be the rose amongst the thorns in the cast, but she acts like Minam and gets along well with us without any awkwardness (laughs). She is very into her character during Heartstrings so I felt like Gyu won was becoming more like Shinhye. Q. Impressions of Shinhye during Minam era and Gyuwon era is totally different? SH: Although this may sound weird, those 3 actors working with me during You’re beautiful must have seen me with long and short hair. I cut my hair short after scenes where I had to act as a girl, they said that shorter hair is better and told me not to grow my hair long in the future! But recently when I had hair extensions longer than my hair today, Hongki said to me when I met him: Wawa, long hair is very pretty… Who should I listen to! YH: (determined) I have absolutely no problem! SH: YH was also in the semi-finals..
YH: Really? Then you must have put some thought in it. (Hears that he was not in the top 4) You must have eliminated me first! YH: (Ask about his competitors) A~ So I’ve lost to Hongki, that means I have already lost in the preliminary rounds. SH: Nono, you were in the top 8. I already said you were in the top 8. SH: Hahaha, actually it’s not like this. When I was having a hard time choosing, the audience shouted Jeremy. During the finals between Geun Suk oppa and Won Bin senior, it was also because everyone shouted Geun Chan. So rather saying it’s my ideal type, it’s more apt to say that it was according to the audiences’ tastes. (Looks at YH throwing tantrums) Why? We are not of that relationship. YH: Because I am blood group A. There’s nothing wrong, I’m contented with top 8. Really! Q. Please share with us a memory during filming. SH: There was scene where Yonghwa had to drive, it was quite scary. He just got his lesson and could not step on the accelerator properly. Partly because of my fear, he got even more afraid, but I’ve heard he is a good driver actually. YH: Nono, it made me nervous to be driving someone and acting at the same time, the road was also very narrow and bumpy. SH: So how is your driving now? More familiar? Q. We really want to know what happens to Gyuwon and Shin after that, have you guys thought about it before? YH: Shin seem to have met Kim Dongjin (Jang Dong Geun’s character in A Gentleman’s Dignity) two days before. YH: I even met Jang Dong Geun senior. Shinhye gave me call when the episode aired, she was shocked by my appearance. SH: I saw Yonghwa in Gentleman’s Dignity when I was filming for a short drama. I immediately took out my phone and snap a photo and send to him. It was right at the moment when he was staring Jang Dong Geun sideways, the image was very interesting. Q. Shinhye said both of you are in a stage whereby you can both clean each other’s nails, what if you are to define your relationship now..
YH: Eh.. Sending congratulatory flowers during award shows - relationship? SH: A.. I received Yonghwa’s flowers during 2012 Baeksang Arts Awards ! But the cameras wasn’t filming him when he was giving me flowers secretly from behind. I told him to be more upright next time and give flowers upfront. YH: Actually I wasn’t caught on the camera a year ago. I wanted to be more upright and pass the flowers to Shinhye this time round, who would know I would get jitters at the last minute. I would be more bold the next time I give flowers! YH: Yes.. So when exactly is necessary? SH: Just joking just joking! There was no game to clean each others’ fingernails during Heartstrings.. (Think for a moment) Till now we can know what each other are thinking just by looking at their faces? Even though we have not met for a very long time, we can still remember clearly filming times, so we have not changed at all! Q. Since both of you share a good relationship, it must not have been easy to shoot intimate love scenes because of the awkwardness? YH: Rather than being shy, we are more embarrassed. SH: Yes, the extent of embarrassment is about the same for both of us. YH: Especially during the scene when I had to chant to Gyuwon that she had fallen for me. Q. What kind of relationship are you looking forward to if there is a third chance for both of you to collaborate? YH: Wa, if we were to collaborate for the third time then we must have great affinity! But won’t the audience be too obsessed with the past dramas? SH: Yes.. we might probably be despised. Then we should not act as lovers, what about colleagues or something? YH: Shinhye will act as a young heiress while I act as her driver? (In a deep voice) Ok, Miss have arrived. SH: Police is fun too, it would be good if we were partners! YH: I always thought the role of pilot suits Shinhye. (To Shinhye’s manager) Isn’t it? SH: He always told me to try the role of pilot. SH: Handsome Leeshin acted. The Stupid members are also very handsome! Therre are many fresh-looking guys! YH: Handsome Junhee (CNBlue fellow member Kang Minhyuk) acted also. It’s a drama suited for the young and cheerful! Q. What do you want to do in the summer? SH: I will be acting as a law student in the movie 23th December from end of July. I have already started preparing for my role. YH: I will be releasing a new Japanese single Come on on 1st August, I will be back in Japan. I had a break recently, I went back to Busan for about 3 weeks. I had a great time so I will be working non-stop during the summer. I really do like this couple! 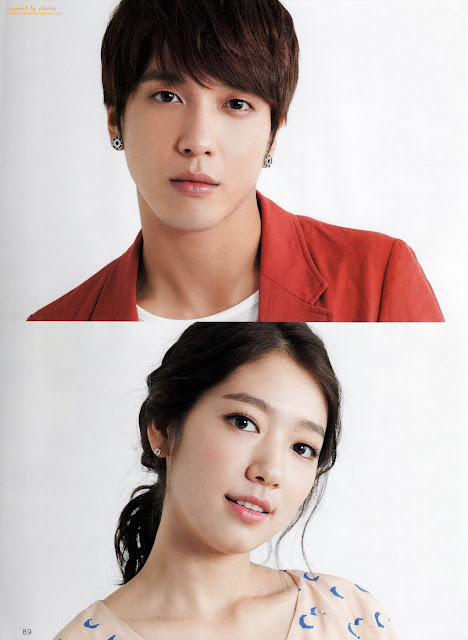 Now I want to watch the Heartstrings again coz of this photos! Argh! Haha! i also watch heartspring for already 10x bcos it is a niece movie.. i like it bcos they never seperste like mars taiwanese movie i like it also bcos eventhough wat problem they face they still strong holding each other hand so that they wil never separate.o hope it will be having heartstring2..make it more romantic. god bless and moe movies to both of u. WAtching them so happy, laughing and enjoying each other's company always brightens my day..
Its always a joy and pleasure watching them..
What a lovely set of pictures. They are looking beautiful. I really love them together and enjoy their interactions. 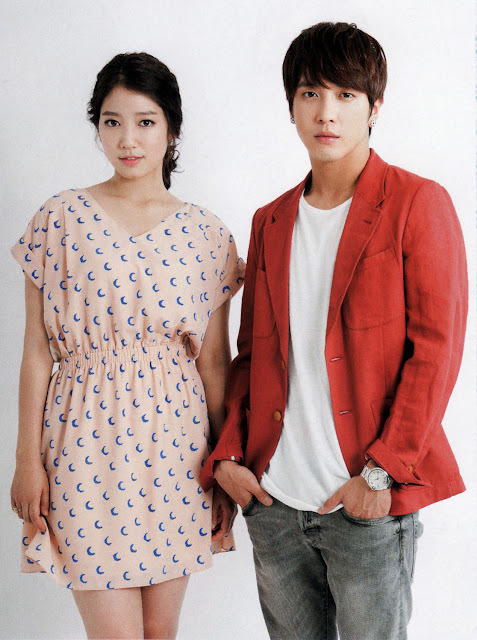 Wish they were in another project together .......heartstrings 2 would be perfect but too good to come true :( Meanwhile I"ll just keep myself entertained by rewatching all their previous stuff and reading about them.......that in itself is pure fun. Wow, what a Perfect & Lovely Couple. Wish them all the Best in everythings. Agreed that they are for "REAL"!!!!!! They really made for each other. Looking forward too for both of them in a DRAMA again especially ROMANCE. do you notice the similarities of their feature? side-view wise, they look a like! i notice them since the YAB days. and in "heartstring" and now in the pictures, jyh's face is very neat and clean to look at... and fresh too. if i remember it right, shin-hye commented before that the more you look at him (during the post yab interview, you'll discover that he is handsome...? and he takes care and treat her like a glass so fragile...so gentle and with finesse. <D!!!!! this photos are lovely!!! i love you, Dooley Couple, wish you lots of blessings!! ..wow!the ideas you gave in your comments are great! it would be awesome to see them in new projects, especially romance..
i think YAB's director is a great man because he made them meet each other and be good friends..but we have to thank Heartstrings' director because he made them be a lovely couple in this lovely drama!!! i loved this photos! !they are a lovely couple!! and thank you very much for posting!! Most of the time, the man that woman tend to date, is not her ideal man. Agree? Ideal is just ideal, meaning in fantasy. But in reality, YW and SH is so compatible! So doesn't matter if YW is not her ideal. After all, both of them get along very well. Look super sweet and cute together! Both os them look so beautiful & handsome on the above pose. They really look like a couple in real life. It will be great that they pair up again in a Drama. Ahem... I don't want to be presumptuous. But Yong Hwa's intent could be read between the lines. Only, it is out of respect to make it not so obvious and discreet. And Shin-Hye's wishes to let him give the flowers up front is something to consider. After all, Hacci... having Yong Hwa for a boyfriend is not bad at all taking into notice how he treated you with full reverence. Whatever, where her heart is and your happiness, you have my support. YongShin is a very nice tandem ever..
You guys really look cute together! And I think you are compatible. 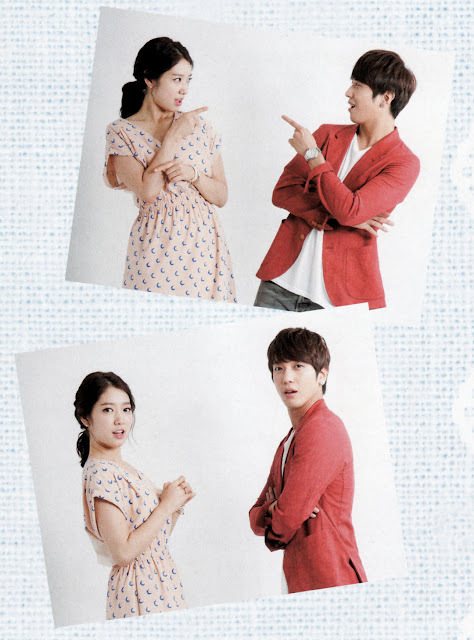 YONGSHIN <3 <3 <3..more projects together PLEASE!! She is so beautiful and natural I love the way you act! !